Targus is offering one of the greatest offers this August. These offers range in good variety and are applicable on iPhone cases, iPad cases, SENA Covers and Backpacks. These offers are specially designed keeping the partner’s benefit in mind and will be a profitable deal for everyone. Targus IPhone cases have some of the unique features like Compression fit technology for easy to slip IPhone, All round edge protection, Shock absorbing for extra protection and scratch resistance protection. Targus wallet case offers Hidden, Secure storage for credit card and ID in secure compartment; this is innovative and patented design by Targus. Cases are available in various eye catching colors like Imperial Purple,black,Blue,Red,Bronze,Anthracit etc. Sena Covers provides Full-grain leather, which is incredibly strong and, if maintained properly, will last for years. Soft and malleable, leather stretches and adjusts to curves. 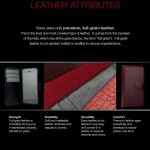 Sena leather is not altered in any way, and comes in a variety of natural textures and colors. Thinnest pouch offers, Light zero bulk protective layer, Soft velvet lining with stitching along opening, Protects bottom charge port with speaker openings & Classic ultra slim design. This classy product makes sure that you make a style statement where ever you go. SENA will also be coming up with new and improved deals for the partners all over India. iPads are the most cherished product and safe keeping for such unique and expensive products we need supportive and durable products which is the USP of Targus iPad cases and covers. They have more than 6 viewing options which will help viewing from different angles and makes it an easier experience. iPad cover & cases offers are available on Vucomplete, Slip Case, Simply Basic and Vuscape range of products. Targus is offering the best-selling award winning cases for Apple’s 4th Generation iPad Retina tablets at unbelievable prices to the channel. Great opportunity for partners to make great profits” says Arun Goenka, Sr. Manager -BD, Targus India. “Sena are leaders in premium leather case’s for Smartphone, and there isn’t any brand in India which depicts such quality” Manish Aher, Country Manager Targus India.